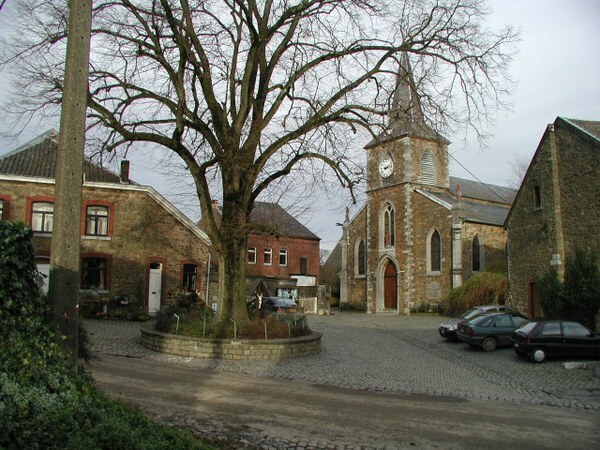 Becco is built on a promontory and this small rural village likely owes its name to the Romanisation of "bôkholt" (beech wood), although the popular explanation refers to the relative poorness of the soil: "en’na nin bêcop" (in Walloon: there isn't much of it). The view over La Reid, Hestroumont and the Rohaimont woods from this village is magnificent. The village is formed of a row of small farms and 17th century houses. The overall unity and homogeneity confer considerable architectural value on the hamlet. Becco's first chapel was completed in 1714 and dedicated to St Eloi, the patron saint of goldsmiths and blacksmiths. 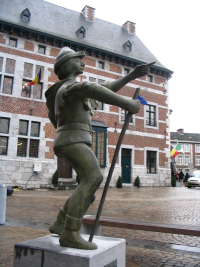 A statue of St Eloi with his anvil stands above the main door. Nearby, there is an imposing lime tree with the Croix du Tilleul (Lime Tree Cross) dating from 1890 at its foot. The village was established by a stream near a deposit of iron ore which was mined in the past. Agriculture has occupied the most fertile land and the forests have been relegated to the less favourable locations. On the Theux-Becco road, there is still a small fort, part of a defensive and observation line under the responsibility of Tancrémont fort. This village is the location of the legend of the two possessed men of Becco.